A must for every cook! 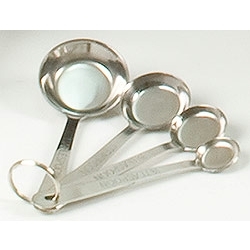 This Stainless Steel 4-Piece Measuring Spoon Set is a kitchen utensil set* that assures accurate measuring of spices and other food preparation ingredients. The high polish finish and long handles on these pieces are special features to delight any cook. Comes in the standard 1/4 teaspoon, 1/2 teaspoon, 1 teaspoon, and 1 tablespoon sizes and is suitable for the home kitchen, the RV, or for camping. *This stainless set now has a new, more contemporary look than what is shown. Set is held together with a metal ring. Stainless steel construction Is designed to last a lifetime. Thick gauge stainless Is durable and will not bend with use. High polish mirror finish Adds attractive element to kitchen decor. Long handles Help dip ingredients from tall jars or deep bags.